The black powder-coated steel hardware is perfect for any interior space and it's sturdy enough to support a loading weight of up to 110 lbs. Soft-close options are available. 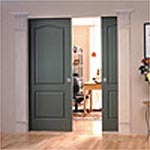 For 3/4" to 1-3/4" thick doors. Hangers, guides for Series 1166, 2200, 2200F, 134F, BP150 and BP250. For 1-3/8" to 1-3/4" thick doors. 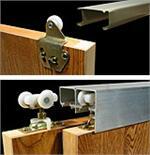 Ideal for 1/4", 1/2", & 3/4" by-passing glass or plywood doors. 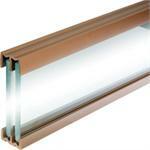 Make your sliding doors close quietly and securely. Available for select hardware sets. Make your sliding doors close quietly and securely. Available for select hardware sets. Need soft-close & open? Order two kits. Make your sliding doors close quietly and securely. Available for select hardware sets for doors up to 88 lbs or 150 lbs. Need soft-close & open? Order two kits. 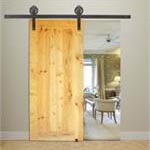 From closet doors to custom room dividing door applications, we offer a complete range of sliding bypass door hardware. Our Sliding Bypass Hardware Sets/Kits are packaged for 2, 3 and 4 door operation. If you have special requirements, all of our hardware can be ordered by the piece to create unique configurations.